At Tate & Lyle, we have a deep history of supporting the communities we call home, through sharing our time, talent and resources. In 2018 we made a real impact. We’re proud that we were able to live our purpose of Improving Lives for Generations in communities near and far; one meal, one family, and one classroom at a time. Here are 273,000 ways we helped in 2018 and, in many cases, it starts with a healthy meal.. In the United States, United Kingdom, and in parts of Italy and Australia, we donated, packed, and delivered over 265,000 meals for families in our communities, working through our network of community food bank partners like the Northern Illinois Food Bank (Illinois), the Trussell Trust (UK), Banco Alimentare (Italy) and OzHarvest and The Food Bank (Australia). Did you know that in the last year we helped over 1,000 school children learn about nutrition and leading a balanced lifestyle? Through healthy eating and nutrition education programmes such as Healthy Eating, Happy Learning (Shanghai, China), and our Food 4 Thought partnership (Hoffman Estates, US), we not only made sure these children had enough food to be ready to learn, but also helped show how increased physical activity can support to healthier life. STEM (Science, Technology, Engineering and Mathematics) careers continue to lead the job market in growth and we want to be sure the next generation of technical professionals are ready for the workforce. 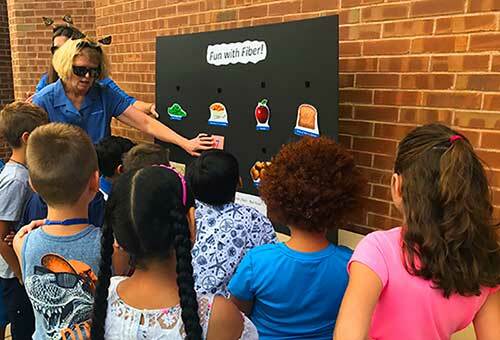 In the past school year in the US, we worked through our public schools foundations to award local classroom grants, ensuring more than 7,000 students in the communities in which we have operations, have the opportunity to discover and experience science, technology, engineering and mathematical concepts. These are just a few of our community outreach highlights. We look forward to sharing many more across the coming year as our teams continue to work alongside our community partners in building stronger and healthier communities today and for generations to come.